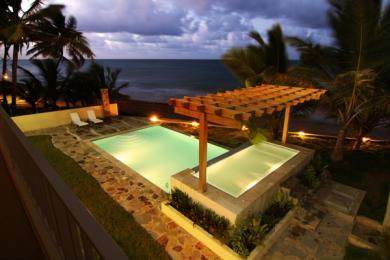 This 2 story, two bedroom, 2.5 bath penthouse is located in an intimate project comprised of just six luxury beachfront apartments. Each condo offers large sliding glass doors and windows for full ocean views from both the living room and bedrooms. Designer appointments include custom mahogany cabinets, granite counters, imported tiles, two spacious terraces, and carport. For a second floor 2B/2B condo see listing AP6076AB $199,950.